The European Commission has told Italy's bankrupt national airline, Alitalia, to repay a 300m-euro ($380m; £247m) loan to the Italian government. 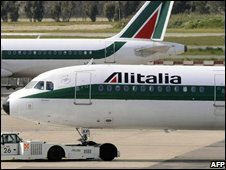 The Commission also approved the proposed sale of Alitalia assets to the Cai investor group. EU Transport Commissioner Antonio Tajani said the rescue loan had to be paid back to the government "by the airline itself", not by Cai. He said the government loan to Alitalia amounted to illegal state aid. As a result, it will have to be repaid out of the proceeds from the airline's liquidation. The 300m-euro loan was given to the company, in which the government owns a half share, in April. Alitalia filed for bankruptcy in August after dodging the move for years as it battled with frequent strikes, rising oil prices and political interference. Cai made an offer of 1bn euros for Alitalia two weeks ago. Mr Tajani said the approved takeover of Alitalia would lead to "the emergence of a private airline, smaller in size but more efficient". Meanwhile, many Alitalia employees are upset at plans to sell the bankrupt airline's profitable assets to Cai, formed by a group of Italian industrialists. A 24-hour strike by pilots and cabin crew at the national airline started on Tuesday and has caused disruption at Rome's main airport, Fiumicino. Alitalia is one of the best-known names in global commercial aviation and has been in business since 1946.